Arcana Studio and Shout! Factory today announced the casting of Golden Globe-winning actor Ron Perlman and Oscar-winning actor Christopher Plummer in the upcoming animated film Howard Lovecraft and the Frozen Kingdom. Perlman is set to voice the role of Shoggoth, and Plummer has been cast in the role of Dr. Herbert West. Written, being directed and produced by Sean Patrick O’Reilly, Howard Lovecraft and the Frozen Kingdom is the movie adaptation of Arcana’s popular graphic novel of the same name, and introduces a new generation to the imaginative Lovecraft universe through a fantastical, cinematic adventure that entwines new storytelling, events of H.P. Lovecraft’s life, iconic elements of his writings and more! 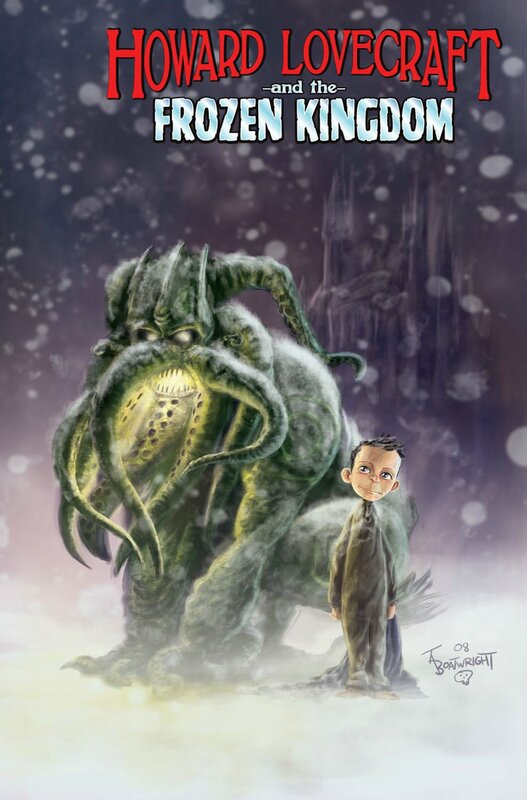 A fun and thrilling animated feature for any Lovecraft fan, Howard Lovecraft and the Frozen Kingdom is slated for a fall 2016 release across major entertainment distribution platforms and in packaged media from Shout! Factory. The film is based on the bestselling graphic novel by Bruce Brown, is written, being directed and produced by Sean Patrick O’Reilly; producer, Michelle O’Reilly; art director & senior modeler, Gary Yuen; senior editor, Brendan Hansell; CG supervisor, Haqui Gbadamosi. Arcana is teaming up with POW! Entertainment, LLC for the production and international distribution of The Unknowns, a new comic book universe. Stan Lee was there when Arcana published our first comic book just over ten years ago. To be working with him on a new intellectual property and creating a new universe has truly been a dream come true! Chris “Doc” Wyatt has been at the creative helm at the project. Working with Stan and Sean has been fantastic. The Unknowns is Ben Ten meets Men in Black with a rock and roll soundtrack. The story focuses on two average teens who help alien protectors disguise themselves as a touring rock group in order to take out undercover cells of invaders. The Unknowns is an idea I’ve had for a while and bringing these characters to life with Arcana and Sean is exciting. He’s created his own comic book character army and he’s kind of a Canadian version of me. Working with Arcana is giving us the opportunity to bring new characters to the Canadian market while expanding POW! Entertainment’s worldwide franchise into a new territory. Arcana has announced that Kagagi, the animated series, will be airing this Sunday, October 5th at 10AM on APTN! You can find Kagagi on APTN East and APTN HD at 10am ET, and on APTN West at 10am MT. MATTHEW CARVER (16), is an Algonquin boy who’s destined to become Kagagi, a Native-Canadian superhero. He must stop his pre-destined, arch-nemesis, THE WINDIGO from destroying the world and gaining universal power. At first, Matthew refuses the call, not wanting to be burdened with responsibility, but as those around him suffer at the hands of the Windigo, he has no choice but to fight as Kagagi, finally accepting his destiny. Kagagi is based on the graphic novel, published by Arcana, Kagagi: The Raven. The Steam Engines of Oz to Debut FCBD 2013! Arcana Comics and Arcana’s SteamPunk Originals is more than a little excited to announce their plans for Free Comic Book Day 2013! They will be presenting an exclusive preview issue of our upcoming The Steam Engines of Oz, plus plenty of extras exclusive to the FCBD edition. Don’t miss your chance to be a part of this special event! Get a special sneak-peek at the upcoming re-imagining of Oz through a SteamPunk lens! Find out what happens 100 years after the witch is dead. In an Oz ruled by a once revered hero, salvation comes from the unlikely wrench of Victoria Wright, who dares to question the status quo and sparks a rebellion. This FCBD edition will give you an exciting extended preview of the upcoming graphic novel and a look at what else Arcana’s SteamPunk Originals line has in store for readers! To celebrate Halloween, Arcana Comics and ComiXology have teamed up to bring 13 Days of TERROR, a celebration of some of the best indie horror around! A number of existing Arcana titles are part of the promotion with special lower prices (and in some cases, FREE), PLUS new titles will be added daily between the 19th and 31st! 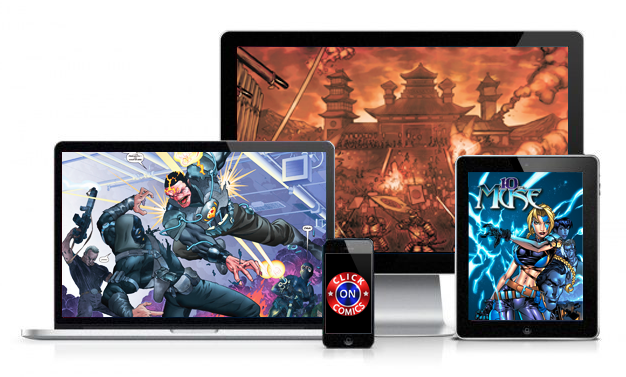 The promotion is featured on the main page of ComiXology.com, but you can access it directly by CLICKING HERE. To kick off the promotion, the below titles have been marked down, so get them while you can! Becoming Issue 1 – PRICE REDUCED! Brooke Burgess, the creator of Broken Saints brings you an all new horror/thriller in Becoming! At a remote university, an angry young student faces the harsh realization that he has nothing to show for years of study. When he threatens his professor to teach him something real, he is drawn into a horrifying game of life and death. Soon, he will learn that the only rule is pain, and that true knowledge only comes when everything you believe has burned away. The Book Issue 1 – FREE DOWNLOAD! It’s Hellraiser meets Flatliners Meets the DaVinci Code when, En route to Italy, a group of American tourists learn of a series of DIY travel guides, nicknamed “The Book”. These unofficial guides are collected and updated with first-hand experiences by the travelers themselves. Different “Books” scatter the continent, telling of the best lodging, deals, and “off the grid” adventures from sight seeing to local folklore for anyone clever enough to find them. A local cult, practitioners of Sanctus Letum, the Holy Death, disrupts the American’s plans for adventure when they hide pages from the Dark Book, Shaitan, in one of the travel guides. The friends are lead down a path of secret religion, death, resurrection, and demonology. The Evil Tree Issue 1 – FREE DOWNLOAD! In a rustic village outside of Manhattan, Misha and her fiance Daren seek an escape from the fast pace of the city. As they settle in, Misha becomes withdrawn, suffering from bad dreams and depression. When Daren brings his friends to the house, little does he know he is setting into motion events started hundreds of years ago with the original occupants of the house, the Willam Family. Not only did the ill-fated Willam family die in the house one cold winter, but the house has developed a history of female occupants committing suicide. The friends must solve the mystery of the house before the Willam Family ghosts pick them off one by one. Philosopher Rex Issue 1 – FREE DOWNLOAD! Meet Dr. Ishmael Stone, Philosopher, detective, monster-hunter, primes inter pares of a shadowy network of supernatural guardians sworn to shelter the world from the Infernal Orders. Philosopher Rex opens at a moment of crisis as the old orders are fragmenting and the Philosophers dividing into rival camps. Stone and his comrades on one side of the battle, the craven Philip Delacroix on the other. Complicating matters: just when Stone and his associates need them most, their various abilities are inexplicably on the wane. Harbor Moon Graphic Novel – PRICE REDUCED! When Timothy Vance receives a call from a man claiming to be his long-lost father, he takes a trip to out-of-the-way Harbor Moon, Maine. But the man is nowhere to be found and, unfortunately for Tim, the town doesn’t take very kindly to strangers. As he struggles to stay alive and learn the truth about his father, Tim discovers that Harbor Moon is protecting an incredible secret… and it turns out that Tim may have more in common with its residents than he could ever imagine! Lethal Instinct Graphic Novel – PRICE REDUCED! Frank Aaron is a police officer who struggles with the curse of being a werewolf. As he investigates the brutal murder of the Mayor’s family, he notices claw marks, saliva, and animal hair at the crime scene, leading him to wonder if he might be responsible. But in the course of his investigation, he discovers that there is another werewolf in town, and he’s forced to use the abilities of his feral side to track down his counterpart and solve the mystery of the murder. Lucas Graphic Novel – PRICE REDUCED! In the backwoods farmland of Rural-Nowhere USA there is screaming, sobbing, then silence. A breeze washes over a sea of grass. One group of nameless, college-aged fodder becomes the plaything of The Family. Cannibalistic sadists. Evil and cliche all at once. The day retreats. Night falls. Amid the torture and terror a killer arrives. Lucas. Massive, resolved, the nightmare of nightmares. Over the remaining hours of the night Lucas usurps The Family’s reign. He overtakes their home, their routine, their confidence. He sends their twisted world in to chaos. One by one, the family bows to the finality of the judgment come against them. Marlow Graphic Novel – PRICE REDUCED! Marlow is an ex-Marine caught in a dilemma impossible to solve: commit atrocious acts for a global corporation in order to receive medicine that keeps him from reverting to a zombie state, or walk away and suffer the fate of becoming some terrible creature. Struggling with his fears of his affliction and the monster he might become, Marlow abandoned his wife and young daughter, losing his dignity and freedom as he chose a nihilistic life. It is only during this journey that Marlow realizes that perhaps by avoiding suffering he has become like the zombies he so fears to become! Poe & Phillips Graphic Novel – PRICE REDUCED! At the end of the 19th Century two men, Edgar Poe and Howard Phillips, will find themselves in the middle of mysterious adventures as Investigators of Paranormal Affairs. The two will discover mysterious coins that have the power to revive an emperor and his demonic army. It is up to Poe and Phillips to secure these coins lest they fall into the wrong hands and usher in the end of the world! Velvet Rope Graphic Novel – PRICE REDUCED! Admit one to a new collection of horrifying tales! Grab your popcorn and candy, as Velvet, the beautiful usher from beyond the grave, introduces Arcana’s brand of spine-tingling horror in this anthology. Featuring stories from Mark Poulton, Stephen Sistilli, Dexter Weeks, and many more. Velvet Rope is sure to make a killing at the box office! In the coming days, Arcana will be releasing the below titles and more, all at amazing prices! Core mining, the deadliest job in the galaxy, draws only the bravest, or craziest, workers around. Bumping up to asteroids, typically propelling at astronomical speeds towards distant stars, the miners harvest minerals essential to interstellar travel and commerce. Close quarters, dangerous conditions, and less than a half inch of polymer sheath stand between them and swift oblivion. When the Harvest Moon stumbles upon a goldmine dangerously close to a star, the last thing they expect to find is an ancient alien race preparing to hatch an infestation throughout the system. 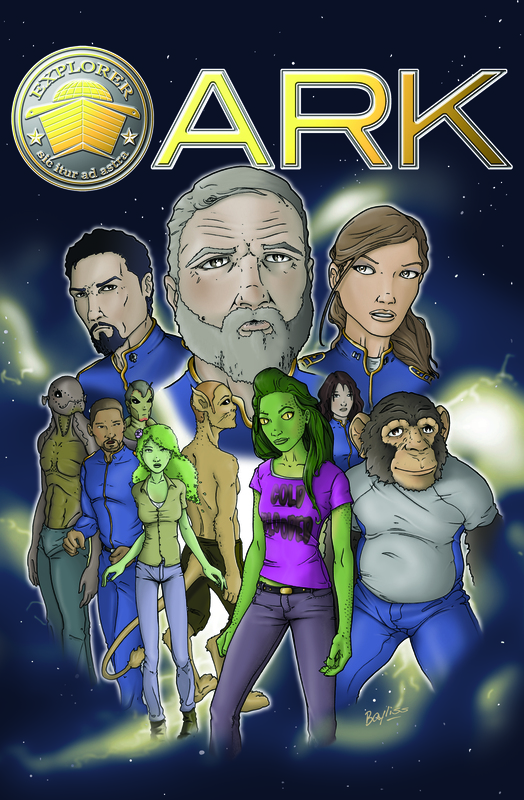 Armed with mining tools and sour attitudes, Captain Cyrus Layne and his crew must survive the horrors of space and an unfamiliar enemy to escape with their lives. It’s a sci-fi mixture of Deadliest Catch, Armageddon, and Aliens. Deep space, close quarters, and sour attitudes. Collecting the four-issue hit mini-series, Intrinsic features horrors from different worlds assembled to bring about a global threat known only as The End. A Philosopher has recognized the signs in time to gather his own forces for Good – including an ordinary, powerless young woman. Only together can they avert disaster on a biblical scale. Every last one of them… is Intrinsic. ‘Intrinsic’ is a company crossover event bringing together characters from hundres of titles beneath Arcana’s library. It is an event of unprecedented ambition, unlike anything that has been before. A great introduction to Arcana Comics! Marvel’s Dark Avengers through an indie filter. At a remote university, an angry young student faces the harsh realization that he has nothing to show for years of study. When he threatens his professor to teach him something real, he is drawn into a horrifying game of life and death. Soon, he will learn that the only rule is pain, and that true knowledge only comes when everything you believe…has burned away. Written by Brooke Burgess — the award-winning creator of Broken Saints — with art by Dane Cypel. A psychological thriller from the creator of Broken Saints with dark themes, gorgeous art, and amazing colors. Collecting the John Henry: The Steam Age preview book and the digital-exclusive issues 2-4. John Henry, a former slave, wasn’t about to let some new-fangled steam hammer replace his ability to earn an honest wage as a steel driving man. He’d beat that machine, or die with his hammer in his hand. We all know the outcome of that legendary contest. In this alternate history, however, John doesn’t die in his heroic effort, but instead slips into a coma, only to awaken to his worst nightmare. A robotic uprising has occurred, and a new age has dawned – The Steam Age. Now, the only thing that can free the human race from the very machines they’ve created is John and his hammer. “John Henry: The Steam Age” is an exciting re-imagining of American folk hero John Henry in a SteamPunk setting. Take the folklore of John Henry and throw him into a SteamPunk Apocalyps, and just imagine the possibilities. This is the first in our line of SteamPunk Originals books, and we’re looking forward to sharing more in the coming months!!! Nikola Tesla is a hero to the SteamPunk community and revered as an inventor. This is his story from his humble beginnings to his amazing inventions, which changed the world. A must-have Christmas Classic featuring an all new extra tale at the end of the book, a new introduction, and a new cover!